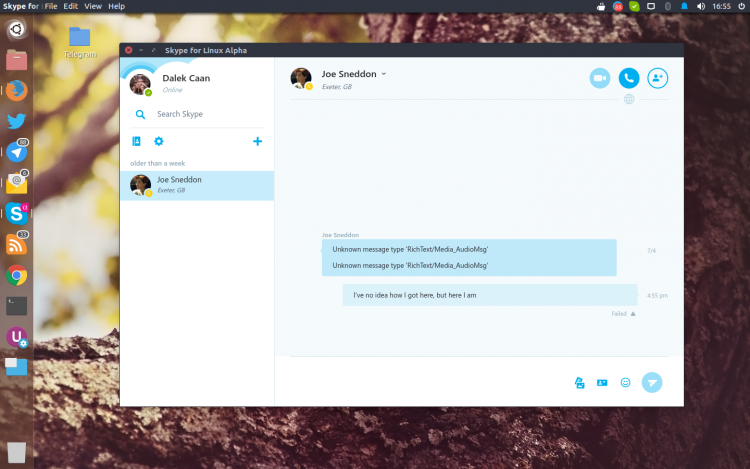 Today is a happy day for all Linux Skype users because Skype has announced a brand new Linux Client and you can start using it right away. According to Skype, the launch of their Skype for Linux client reaffirms their “commitment to the Linux community.” And by Torvalds it should because the present Skype for Linux Client has received any updates in over two years! It will even be deprecated soon. Web-based technologies are used for more than its communication protocol: the client is built using the well-tested and trusted Chromium-based Electron shell and Node.js combo, which allows the application have a native look and feel, and to also offer some basic OS level integration like a system tray icon. Because this new release is an alpha version it certainly has a number of drawbacks. For one, users can’t make or receive calls to or from anyone still in use of the previous versions of Skype for Linux (v4.3.0.37). The same goes for video calls. Don’t worry -the missing features would not stay that way for long. Note that Skype cautions that this alpha release is not a fully functioning Skype client yet and have assured users that more features will come in the near future. Feel free to grab the latest Skype for Linux (Alpha) and let us know about your experiences in the comments section below.